samples via laser ablation. The cell is mounted on top of an XY stage and enables analysis of multiple samples mounted in two styles of sample holder. 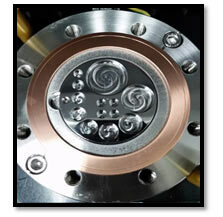 The noble gas cell is integrated with the RESOlution system via the GeoStar software. 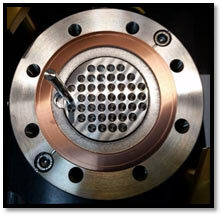 Connection of the sample cell to the mass spectrometer is made through a flexible bellows. Fully compatible with existing RESOlution instruments. Hot plate and wrapped gas transfer lines are controlled with an integrated PID heater control unit for both manual and timed automated bake-out of samples prior to analysis. The standard unit is supplied with a 43 position conical sample holder and a multi-sized flat bottom sample holder. Multiple sample holders are available and custom styles upon request. Available fused silica or Z-cut quartz window.